Water is connected to every mountain. We cannot imagine alpine nature without small streams, waterfalls, lakes and rivers. If you decide to spend your holiday at our place, you will be in touch with water almost every day. We will certainly provide you information about every water activity available within the neighbourhood and close by. Swimming: Never trust people who say that even summer is cold in the Alps. Hardly anybody knows that Lienz (capital city of Ostiroll) is the sunniest place in the whole of Austria, and summer temperatures are always comfortable to swim. You can enjoy the clean and warm water of Tristacher See above Lienz or the calm atmosphere of a small aqua park in Virgen. Make no mistake; swimming beneath the Alpine mountains is a very special and relaxing place to be. Rafting, kayaking, canyoning – You may think that this is not for you. But you could well be mistaken. 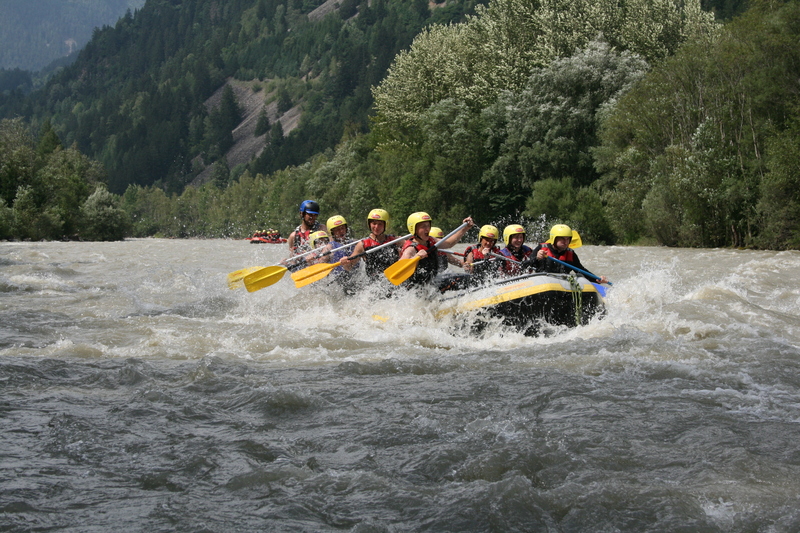 The small village of Ainet is a rafting centre of east Tyrol. A lot of Rafting clubs will provide you with the action of your life. After a short training session has been provided, you can start your rafting carrier. You can choose any level from beginner to advance and sport plus. It doesn’t matter if you have never been on a raft before. Even you can make it! Canyoning is also very interesting. Many our guests consider this adrenalin sport as the best experience of their lives. You will have to dress in a scuba suit and with a group of other people you climb down river basin with lots of jumps and toboggan slides which makes you feel like a child again.